The Good King René, Roi René 1er d'Anjou, René 1er de Naples, is not just your favorite new king, he's also your favorite new Count of Guise, Duke of Bar, Duke Consort of Lorraine, Duke of Anjou, Count of Provence and Forcalquier, Count of Piémont, Count of Barcelona, titular King of Jerusalem, titular King of Sicily, titular King of Aragon, and Marquis of Pont-à-Mousson. He's also one of the biggest proponents of wine and wine-making in France's history -- maybe that's why his subjects called him The Good King René. My husband doesn't mince words; you might say he's a straight shooter. For example, he doesn't mince words when it comes to my photography, when he teases me for not being such a straight shooter. That is, I have a distinct tendency to lean slightly to the left (true for my politics as well as my photographs). Thank goodness for photoshop, where I can often straighten the problem out. But not always, because sometimes I swear the problem is not me, it's the old French buildings. On this, the day of the Republic, the day of Democracy, what better story than one about the most Greek of Paris' buildings, and one dedicated to the French greats who have influenced the modern, secular nation? It's appropriate that the word Panthéon comes from the Greek and means "All the Gods" because inside this old church is the resting place of many legendary greats who are worshipped in France. I've talked about the American connection to Normandy and World War II many times, and with great pride and awe. But what about our neighbors to the North? 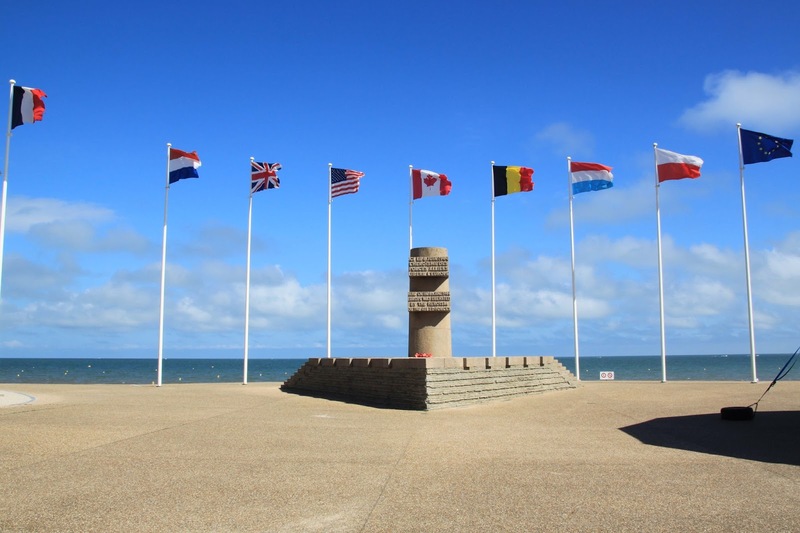 On our most recent visit to the Normandy coast, we take some time to honor Canadians, starting at the Centre Juno Beach, which was the invasion beach tackled by the Canadians -- perhaps less famous than Omaha Beach but still plenty bloody.